Mr. F.W. Grant was born in London, England, in 1834, moved to Canada at age 21 and was ordained to the ministry of the Church of England. Upon further study of the Word and reading books of the type still published by Believers Bookshelf, he left his parish to gather to the Lord's name alone. Later he moved to the USA. His most famous writing was the Numerical Bible, bound in seven large volumes and still in print. He passed into the presence of the Lord in 1902 on his 68th birthday. 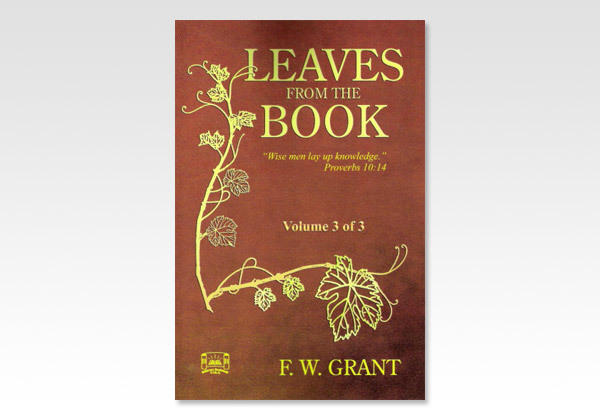 Leaves from the Book was written by Frederick W. Grant, and has been out of print some years. Believers Bookshelf, Inc. now presents this classic book in three volumes. 136 pages - Softcover - Author: Grant, F. W.